If you cast your mind back a couple of months, you might recall the bizarre reality webshow, Azeroth Choppers. In it, two teams of Blizzard folk constructed choppers based on the Horde and Alliance factions, overseen by that professional shouty man and bike maker from American Choppers. Upon creation of the choppers, folk were asked to vote for the best one, which would make it into the game. Of course, that meant that one faction would miss out. 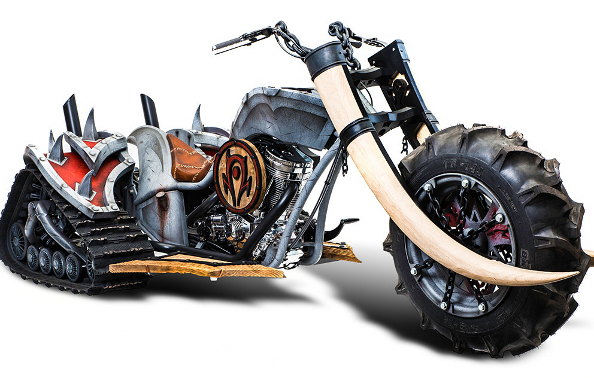 It was the Horde bike that won – because tusks on a bike are pretty wonderful – leaving the Alliance with nothing. Blizzard have backpedaled, however, and now both bikes will be available for World of Warcraft players. Both choppers will be available when Warlords of Draenor launches later this year. 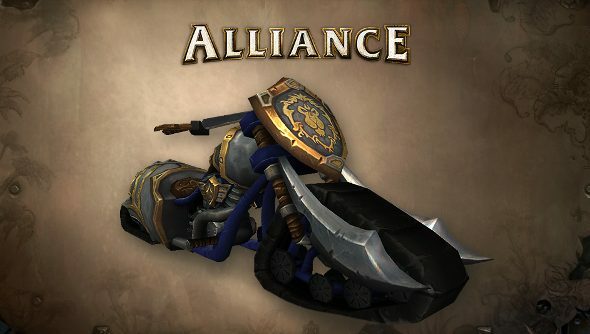 While the Horde chopper is a free gift, available to anyone who logs in before September 30th, the Alliance chopper will cost “a pretty hefty sum of gold”. Here’s the Horde chopper again, to refresh your ailing memory. Bikers will only be able to ride the choppers for their respective factions, so you won’t see any orcs astride the blue and gold hog.